Imagine you're on a train on your way back from a school trip. Just as it goes into a tunnel, the train crashes. You wake up in the world of Dragonhead - trapped underground with a hundred corpses, not knowing why you crashed. 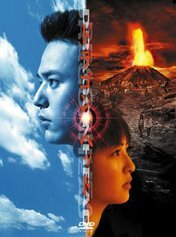 Dragonhead is a recent, big-budget disaster movie from Japan. After a slow start in the tunnel with a wrecked bullet-train - the story opens out into a classic apocalypse scenario - a handful of survivors facing what looks like the end of the world. There's plenty of action, but this isn't a gung-ho adventure - it's more realistic, with the survivors usually in a state of despair, facing challenges to their survival and their morale. Throughout the film, there's a consistent feeling of loneliness too. The survivors are dwarfed by their desolate surroundings. Each place they encounter underlines how easily society can unravel. The mood is similar to earlier downbeat apocalypse movies like The Day the Earth Caught Fire, Crack in the World, Deep Impact, or even The Omega Man. The special effects are spectacularly realised, offering visions of the results of widespread destruction. This was achieved with seamless digital compositing that combined computer-generated vistas with huge sets and actual locations filmed in Uzbekistan. The film was shot 2.35 widescreen, and appears to have been recorded on High Definition video - the quality is excellent and rarely looks like video (this doesn't look like 'v-cinema', by any means). HD was probably used because of the huge number of digital effects (the same method that George Lucas used for Star Wars 2 and 3). 3 young stars head the cast: pop singer Sayaka, Satoshi Tsumabuki (who rarely seems to be out of work) is here re-united with a co-star from the Waterboys movie, Takayuki Yamada. Satoshi and Sayaka carry the brunt of very demanding, physical roles as the young hapless teenage couple Toru and Ako. The director is George (or Joji) Iida, whose Rasen (1998) was an under-rated first sequel to the now infamous Ring (also 1998). His sci-fi thriller Another Heaven (2000) was much more successful. You won't be surprised to hear that Dragonhead was based on a series of manga. Written by Minetarou Mochiduki, his Shark Skin Man and Peach Hip Girl was also made into a film, which I watched yesterday without realising the two were linked! The quality of special effects rivals Hollywood and the story takes some twists new to the genre, but this film has only just emerged on DVD in the US. I'm constantly amazed at how we miss out on such large-scale movies until years after their release.